This was one of my favorite television series and the books are always fun to read. Of all the things that make Adrian Monk uneasy, change ranks high on the list. So when Natalie completes her P.I. license—and technically becomes Monk’s boss—it’s not easy for him to accept. Nor can he accept Natalie attending a business seminar at sea without him, even if it means spending a week with her on a cruise ship. 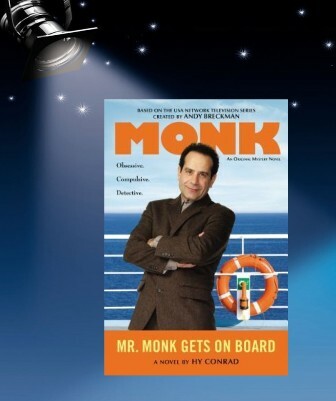 Between choppy waters and obnoxious kids, Monk finds himself in a perfect storm of anxiety. Luckily, Mariah, the cruise director, is always able to smooth things over…until someone pulls the man overboard alarm, the ship drops anchor—and the crew fishes Mariah’s dead body out of the water. Finding alcohol in Mariah’s system, the ship’s doctor declares her death an accident, but Monk isn’t convinced. He knows that Mariah and the captain were having an affair. Could someone have pushed her overboard? Hy Conrad was one of the original writers on the USA Network television series Monk and stayed with the series for all eight seasons, acting as co-executive producer for the last two seasons and garnering three Edgar® Award nominations. In addition, Hy was head writer of the webisode series Little Monk and served as consulting producer and writer on the USA series White Collar. He is the author of hundreds of short stories, dozens of interactive mysteries, and ten books of solvable whodunits, sold around the world in fourteen languages. To find out more visit his webpage here. It should be noted that Lee Goldberg wrote 15 of the Monk novels. Find out more on his webpage here. Monk was one of my favorite tv shows. TBR’d on GoodReads.